You’ve setup Exchange Server 2007, and configured the shiny new Content Filter agent (CFA), which is more than just a rewrite of the equally loved and hated Intelligent Message Filter (IMF) from Exchange Server 2003. How do you configure it? 500 5.7.1 Stop spamming you *****! This is an improvement over IMF, which had only one gateway action (and one corresponding gateway threshold). The Content Filter agent allows the flexibility of enabling all three actions on the gateway. The rule is: SCLDeleteThreshold > SCLRejectThreshold > SCLQuarantineThreshold. So where’s the equivalent of IMF’s Store threshold, used to move messages to users’ Junk Mail folder? Before you jump to conclusions about this being counter-intuitive or confusing, which it may be, consider this – it’s in response to the different server roles in Exchange Server 2007. The gateway actions – delete, reject and quarantine – can be thought of as message transport actions and thus applicable to transport server roles – the Edge Transport server and/or the Hub Transort server (if you have antispam agents enabled on the Hub). Moving messages to users’ Junk Mail folders can be thought of as something that happens at the Store, performed by the Mailbox Server role. Another aspect to consider when setting the SCLJunkThreshold – if you’re in a topology with an Edge Transport server, the SCLJunkThreshold configured on an Edge Transport server doesn’t impact anything. You must have the SCLJunkThreshold configured on your Exchange Org. The Edge Transport server is not a part of it. By default, the SCLJunkThreshold is set to 4. If you have an existing Exchange 2003 SP2 server installed and you haven’t tweaked the Store threshold, IMF v2’s default Store threshold of 8 is used. This is what you’ll see in the Org’s SCLJunkThreshold. Given that the SCLRejectThreshold is set to 7 by default, messages will not move to users’ Junk Mail folder unless the SCLJunkThreshold is lower than the transport thresholds (i.e. the Delete, Reject and Quarantine thresholds). 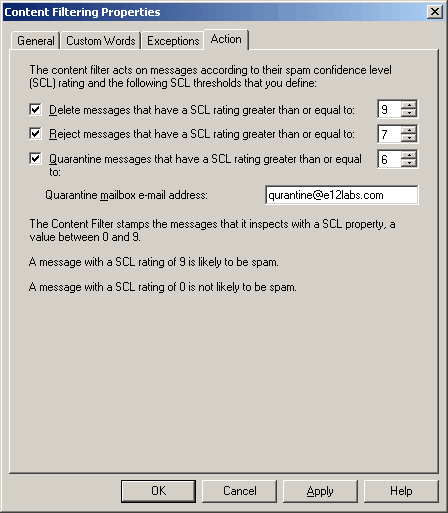 Unlike the transport actions of deleting, rejecting, and quarantining messages, which check for SCL equal to or higher than their respective thresholds, for moving messages to Junk Mail folder the Store checks for SCLs higher than the SCLJunkThreshold. This is consistent with the behavior of IMF in Exchange Server 2003 (as mentioned in IMF Confusion – Store threshold rating text in UI). I have been racking my brain the past couple days on finding the Junk threshold. Thanks a lot for this post!! Thank you for this great post, and the formatting as well makes it easy to read. Thank you, you saved me a lot of time. The value for SCLJunkThreshold will be listed. So does the CFA work if you do not have an Edge Transport? In my single E2007 environment, when I set SCLJunkThreshold to anything other than 8, ALL junk email just disappears, it never makes it into the Junk Mail folder in Outlook. Have you installed anti-spam agents on Hub Transport server(s)? I work for an Hosted Exchange 2007 company and we're modifying the way our incomming emails are filtered. We have a third-party solution that scan all our incomming emails and we want to have flagged emails (using Transport Rules to set the spam confidence level) moved into Junk Email folder. So to resume, when the spam confidence level is X, we want those emails moved to Junk Email folder. For now the only way we were able to make it work is by modifying the Junk E-Mail options into OWA (Automatically filter junk e-mail). As you can understand, we can't ask to our 70000 users to change this setting. So we want to have a way to do it server side. I have take a look at the Glen script (http://gsexdev.blogspot.com/2007/07/turning-on-filter-junk-email-in.html) but I'm surprise that this is the only way to have the flagged emails move to the Junk Email Folder.. It's not working.. again I were able to make it work is by modifying the Junk E-Mail options into OWA. Is there something I don't understand..? Do you know how we can have flagged emails move to the Junk Email Folder? Hi, Can anybody tell me who and how SCL rating of an email is decided. 1. run the "install-AntispamAgents.ps1" command? 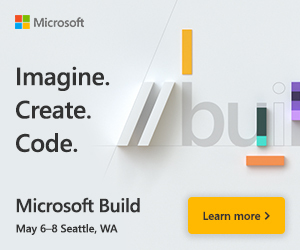 2. tell every user to log into OWA and enable some junk mail option? I'm having legitimate emails to customers marked as spam. How do I prevent this happening? @Grahamrobinson: Users can add customers to safe senders, you can add customer domain or IP address to whitelist / ip allowed list. Exchange 2007 Content FIlter: The Whitelist Is Here! I had another Problem with a migrated mailbox. The Mailbox was exported with Exmerge – on a MSX 2003 – and included Hidden-Files. After import on a MSX 2007 the Junk-Mails didn't go to the Junk-Mail-Folder. Changing the Junk-Mail-Setting in OWA doesn't fix it. The Problem was the existing Hidden-Message that contains the Rules for the movement. After deleting this Message everything works great. I didn't know if there is an other way to delete this Message. I’m trying to disable SCL completely (we have a third party product and don’t want to confuse ourselves in the future if we have spam filtering issues) and trying to figure out which is the culprit (btw, how can I totally disable all of the anti-spam functionality in Exchange 2010?). What do I do? Thanks! Or disable all anti-spam agents. You can also uninstall anti-spam agents from your transport server. See Install anti-spam agents on Hub Transport server. i just want to is there any difference in Exchange 2007 IMF and Exchange 2010 IMF ? i have a option….for which IMF should i go ? Not sure what you mean. You can’t install an Exchange 2007 antispam filter on Exchange 2003 or a 2003 filter on 2007. Install the one that’s compatible with your version of Exchange Server. I did all the settings. however. spam e-mails coming in my inbox. why? Thanks for the post which is right to the topic! Previous post: Windows Vista: Is there really a lack of interest?